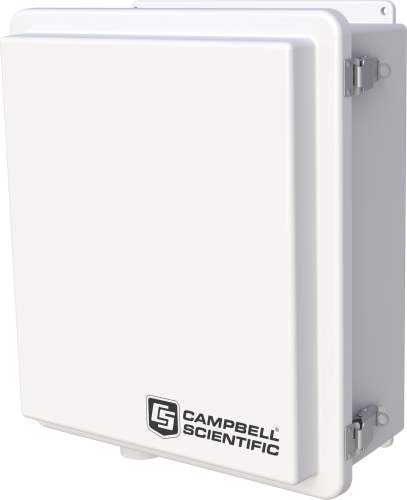 The ENC14/16 is a weather-resistant enclosure that is 14 in. wide and 16 in. tall. This medium-large enclosure can house a datalogger, a power supply, and one or more peripheral—depending on the size of the peripherals. A common use for the ENC14/16 is to mount a larger enclosure to the leg base of a CM110, CM115, or CM120 tripod, because the larger ENC16/18 cannot be mounted to the leg base of these tripods. Please login or register to view 3D files. The ENC14/16's backplate is prepunched with one-inch-on-center holes suitable for attaching a datalogger, power supply, and a communications or measurement and control peripheral. What are the weight and internal dimensions of the ENC14/16? The ENC14/16 weighs 13 lb. Its internal dimensions are 14 x 16 x 5.5 in. What are the distances, center-to-center, of the mounting holes in the back of the ENC14/16? Does the enclosure have a mounting bracket inside to mount the datalogger?